It’s going to take a 400-ton crane to lift the roughly 70,000 pounds of steel, wood and other materials in Korean artist Do Ho Suh’s “Fallen Star” installation. If everything goes well, the sculpture, which looks like a small, traditional Korean home, will be hoisted to the seventh floor of the Jacobs School of Engineering building at UCSD on Nov. 15, and the public is invited to watch. The installation is scheduled to start sometime after 9 a.m.
“It’s going to be a major deal,” said Mary Beebe, director of UCSD’s Stuart Collection, the scattered trove of site-specific works by well-known contemporary artists. Beebe first came across Suh’s work in New York. He’d constructed a small house made of silk and mounted it to look like it was floating on air. The piece was meant to communicate the aloofness and awkwardness that comes with moving away from home—he’d recently left his home in Seoul to attend the Rhode Island School of Design. 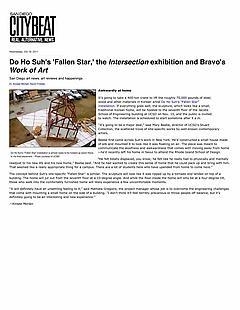 The concept behind Suh’s site-specific “Fallen Star” is similar. The sculpture will look like it was ripped up by a tornado and landed on top of a building. The home will jut out from the seventh floor at a 10-degree angle. And while the floor inside the home will only be at a four-degree tilt, those who walk into the comfortably furnished home will likely experience a few uncomfortable moments.